Mercedes-Benz GLC Coupé Interior, Sat Nav, Dashboard | What Car? 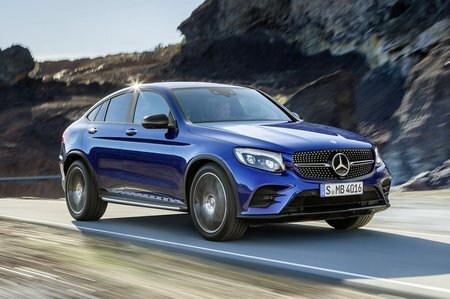 That the GLC Coupé does comfort well and puts it before agility is no bad thing – many buyers will be glad of it. This theme carries through to the inside, where the driver gets a fine driving position with good forward visibility and generous steering wheel and electric seat adjustability, including electric lumbar adjustment. Naturally, the GLC Coupé’s sloping roof means the view backwards is obscured, but a reversing camera comes as standard to get around this. The GLC just pips an X4 for interior quality; its switches and buttons feeling classier to the touch and its dashboard materials feeling that bit plusher. A Macan still manages to wow that little bit more for perceived quality, but it's a close-run thing. Our test cars were all fitted with an optional Premium Plus Equipment package, which features Mercedes' upgraded 8.0in Comand Online infotainment system. It has a bright, clear screen and the menus are easy to navigate, if not quite as intuitive as BMW's rival iDrive system.